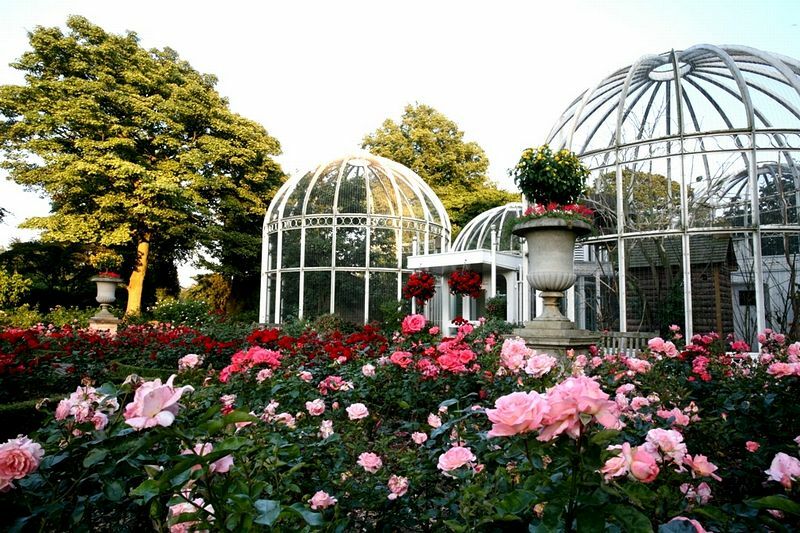 The Birmingham Botanical Gardens and Glasshouses were opened in 1832. They were designed by JC Loudon, a leading garden planner, horticultural journalist and publisher. Apart from the glasshouses, which were added during the latter half of the 19th century, the layout of the gardens is much the same today as Loudon's original design. 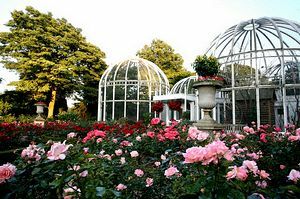 One of the main objectives of the founders of the Botanical Gardens was to encourage the study of plants which were discovered as a result of the commercial exploration of the world which began in the 16th century. A more recent objective of the Society which runs the Gardens is the conservation of species threatened by exploitation. For these purposes, a collection of plants of importance to the human race, has been assembled, particularly in the Glasshouses, which represents a variety of climatic zones. 15 acres of Ornamental Gardens - Sculpture Trail - Formal Terrace - Rhododendron Garden - Rock Garden & waterfall - Alpine Yard - Herbaceous Border - Historic Gardens - Herb & Cottage Gardens - Cottage Museum - Demonstration Area - Theme Gardens. The Botanical Gardens house the National Bonsai Collection. There are exotic birds in indoor and outdoor aviaries including rare breeds of domestic and European waterfowl. A children's Adventure Playground and Children's Discovery Garden and Bandstand Bands which play every Sunday afternoon during the Summer. 'The Shop at The Gardens' and Plant Centre have an attractive range of gifts, stationary, garden requirements and both indoor and outdoor plants. In the gallery there are monthly exhibitions of paintings and drawings - many being available for sale. Enjoy morning coffee, light lunches or afternoon tea in the Pavilion which has a panoramic view of the gardens. Tropical House - 24ft lily pond - Rain forest vegetation - Economic plants including Coffee. Cocoa, Bananas, pineapple, and Sugar Cane. Subtropical House' - Tree ferns, cycads, Orchids and insectivorous plants. Mediterranean House - Citrus fruits of all shapes and sizes, seasonal ornamental displays. Arid House - Recreation of the arid desert, collection of 'living stones'. Telephone for large print or tape guide available in advance. Braille guide book available on site. Free loan of manual or electric wheelchair (Pre-booking recommended). From M5 Leave at junction 3 and take A456 signposted City Centre. Turn right onto B4129 (Norfolk Road) signposted Botanical Gardens. From M6 Leave at junction 6 and take A38(M) to City Centre. Follow under-passes signposted Birmingham West to A456. At Five Ways island turn left onto B4217 (Calthorpe Road) signposted Botanical Gardens.